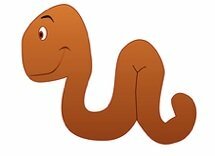 Worm Poop, a natural, organic fertilizer... and you can make your own. Goodbye chemical plant fertilizers and Hello worm poo. Can Worm Poop save the world? Well, maybe not by itself, but worm poo .. or worm castings.. creates a healthy cycle that increases plant nutrients and decreases your carbon footprint in a big way. Worm composting is easy, produces high quality organic fertilizer and it's a fun way to get the kids involved in going green at home. Now, if you're a little bit squeamish about worms or poo or both, read on because worm castings are a super beneficial, natural fertilizer and they're produced by recycling junk mail and kitchen scraps. Worm poop is a waste product of worms. Otherwise known as worm castings or worm poo it's a super nutritious plant food. Normally, poo is not a subject that people get excited about, but among gardeners in the know, this product is referred to as gardener's gold... and for good reason. 1 - 12 x 12 piece of loosely woven cotton. String, elastic or twist tie. Place the cupful of worm castings on the middle of the fabric. Gather the sides of the fabric upward and secure at the top of the ball with the string, elastic or twist tie. This forms the "tea bag". Place the "tea bag" into the bucket and fill with water. Let stand for 24 hours. Remove bag and gently squeeze excess "tea" into the bucket. Pour the "tea" into a watering can and feed it to your plants. On a larger scale, use landscaping fabric as your fabric and a clean 45 gallon drum as your bucket. Pour "tea" into a backpack sprayer and fertilize your vegetable garden, trees and flower beds. Vegetable and fruit matter along with non glossy paper will now be used as worm food and no longer end up in the landfill. You'll no longer need chemicals to feed your plants nor will you need those chemicals to be transported to you. Worm castings are one of the best plant fertilizers in the world. All of a plant's essential nutrition needs are answered with worm poo. Eventually you'll have too many worms which can be sold to budding worm farmers or as bait. If you have an excess of worm poop you can sell that too. This is an excellent project for young entrepreneurs. While giving them 2 products they can sell at the farmer's market, (worm poo and worms) it also teaches them valuable lessons on the natural cycle of plant life and the reciprocal relationship between the earth and us. We take care of Earth - Earth takes care of us. Cool. Have you ever felt guilty when you throw uneaten vegetables away? Now they get fed to the worms. The worms turn them into fertilizer for your garden and you save money by growing nutritious vegetables at home without adding expensive fertilizers. And lucky you, can set up your very own worm poo factory, right on your porch ( or garden - anywhere you like). It's non smelly and self contained. You can buy a kit to start your worm farm or maybe you'd like to try building a worm farm on your own. The worms are fed a fairly constant diet of kitchen scraps and non glossy paper (no meat, bones, fat, oil or dairy please and easy on the onions, garlic and citrus peels). As they munch their way through the food it comes out the other end as a crumbly, dark, nutrient filled additive for your garden and plant soils. Incorporate the worm castings directly into your garden soil or planting pots. Alternatively you can make "worm poo tea" (directions below) to feed your plants, trees and gardens.